In August 2003 the late Mary Raftery published the results of an investigation she had carried out into the exhumations at High Park. Were it not for this investigation our attention would not have been drawn to the additional remains discovered at High Park and the discrepancies in the exhumation applications. 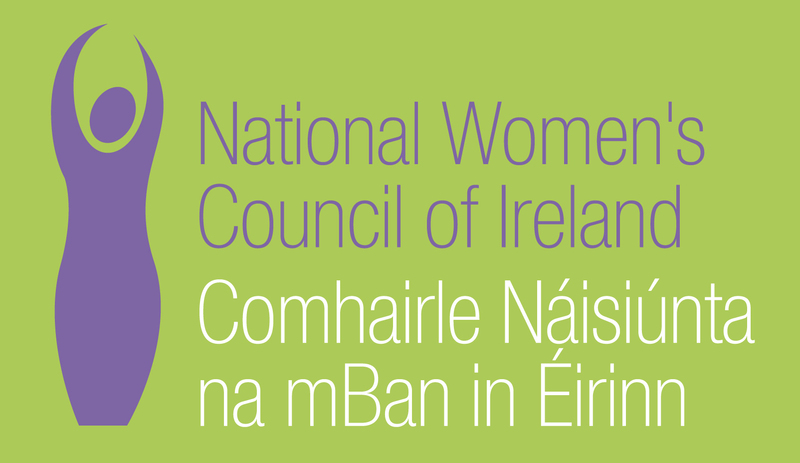 In fact, without Mary Raftery, Justice for Magdalenes Research (JFMR) would not exist. Our country is forever in her debt and given the importance of her contribution to this subject and her work on the industrial and reformatory schools, it is disappointing that the Report the Inter-Departmental Committee to establish the facts of State involvement with the Magdalen Laundries (McAleese Report) mentions Mary Raftery just once by name and at that, only in a footnote. Mary’s collaborator Sheila Ahern (with permission from Mary’s family) has generously given us access to the Mary Raftery Archive, which has been most enlightening in illuminating the gaps left by the McAleese Report. In May 1989, the Sisters of Our Lady of Charity applied for planning permission to demolish their ‘existing institutional buildings…which [had] reached the end of their useful lives’ and to erect 340 two-storey houses, as well as an ‘infirmary unit to re-house old and infirm women and for seven two-storey dwellings to re-house other occupants of St. Mary’s at High Park’ [Irish Press, 4th May 1989, Page 26]. Dublin Corporation was urged to turn down the application because of ‘traffic problems’ [Irish Press, 11th October 1989, Page 8] however in December 1989 the Sisters were granted the planning permission [Irish Independent, 8th December 1989, Page 20]. After the permission was granted The Irish Times reported that the Sisters were selling their land in portions, and while permission was granted for a 5.7 acre section of land, it was refused for another section of land near Griffith Avenue. The Sisters said they would concentrate ‘on the portion for which we have received planning permission…we will have to see where we go from here’. A spokesperson for the Sisters confirmed to The Irish Times that 5.7 acres of land at the corner of Collins Avenue and Grace Park Road would be put on the market the following year [Irish Times, 7th December 1989, Page A1]. 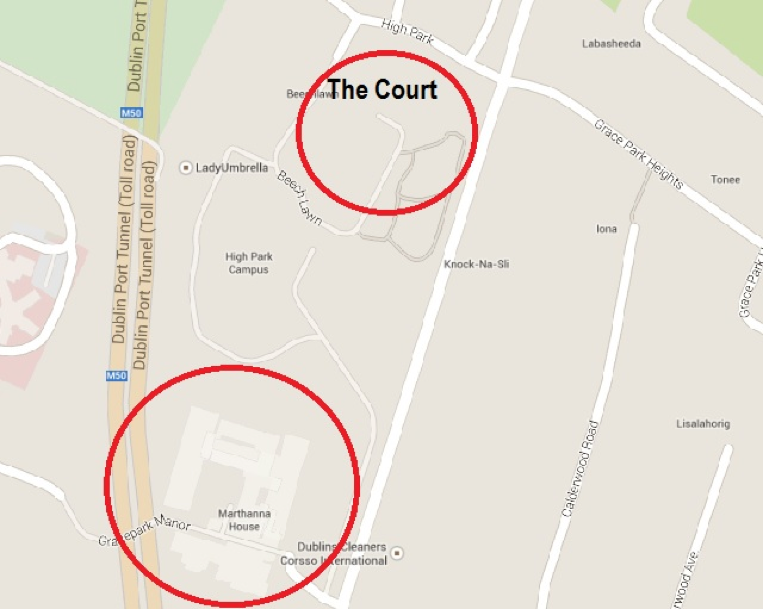 This area of land now incorporates a development known as ‘The Court’ which is discussed further below. In 1991, the Sisters of Our Lady of Charity purchased 5,200 shares (worth $110,000) in Guinness Peat Aviation (GPA) [Irish Times, 8th September 1993, Page 10]. In August/September 1993 when GPA collapsed, the Sisters, along with other shareholders, incurred substantial losses [Irish Times, 30th August 1993, Page 1]. In the same year, the Sisters of Our Lady of Charity ‘concluded a deal’ to sell 11.5 acres of land at High Park, Drumcondra. The Sisters said they ‘needed to alleviate debts incurred by the order’s current shelter and nursing facilities for 40 women at the site’ [Irish Times, 8th September 1993, Page 4]. An Irish Press report in August 1993 stated that the Sisters had ‘recently accumulated heavy debt after building a new centre for women in need’ [Irish Press, 24th August 1993, Page 6]. These reports would appear to indicate that the Sisters needed to sell this land because of recent debts that were incurred. When the property development at The Court is taken into account however, the Sisters’ assertions are seriously undermined. On the same day of the signing of the exhumation licence in May 1993, a showhouse viewing was advertised for The Court, indicating that this development had already been completed at High Park [Irish Independent, 25th May 1993, Page 20]. It is difficult to believe that the Sisters (with the benefit of counsel from their advisers [Irish Times, 7th December 1989, Page A1]) who sold these 5.7 acres of land to fund new accommodation for women in their care, did so at such a loss that it could be described as ‘heavy debt’ just a few years later. Moreover, the Sisters told Mary Raftery in 2003 that ‘[i]n 1989 we needed to build suitable accommodation for our own ageing sisters and those women still in our care and to provide this we had to dispose of some of our property of which the cemetery was a part’ [Mary Raftery Archive: Statement from the Sisters of Our Lady of Charity]. 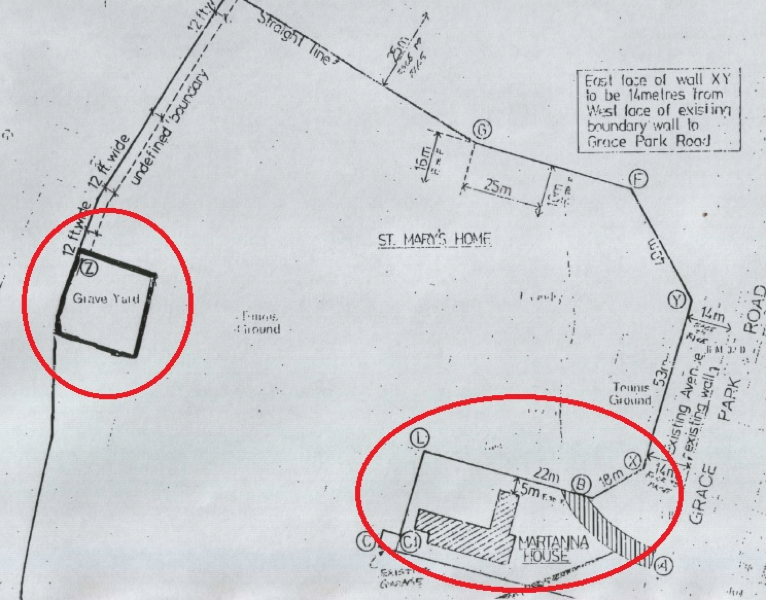 If the land on which The Court was built was the same land sold to fund the new accommodation, then the Sisters’ statement cannot be correct, as St Mary’s graveyard was located in a completely different area of their property, as shown in Fig 1 and Fig 2 below, using Martanna House as a reference point. Furthermore, the exhumation licence was not applied for until 6th August 1992 [McAleese Report, Chapter 16, Section 78] and the development at The Court was advertising showhouses around the time of the signing of that document. Additionally, reports from the Health Information and Equality Authority (HIQA) note that Beechlawn Nursing Home which is located on the former laundry site, was established in 1992. Thus, it seems reasonable to conclude that the 1989/1990 sale and the 1993 sale were two separate transactions and questions must be asked about the Sisters’ claim that the land sold in 1993 (from which the women were exhumed) was to pay the debts incurred from building new accommodation for the women still institutionalised by their order. The land being sold in 1993 included a graveyard (St. Mary’s) which had – according to the Sisters at that time – been used between 1886 and 1986 [Mary Raftery Archive: Letter of 16th June 1993 from Eugene F Collins Solicitors, Ref MEB/GH/JK]. This is contradicted by the McAleese Report, which states that the graveyard was used from 1889 to 1976 [McAleese Report, Chapter 16, Section 74]. It is unclear which is correct and the Report does not clarify the issue. The Report also notes that St. Mary’s was the burial place for ‘consecrates’ in High Park, i.e. those women who allegedly chose to spend the rest of their lives there. On 6th August 1992, the Sisters of Our Lady of Charity applied to the Department of the Environment for an exhumation licence to relocate the remains of women buried in St. Mary’s graveyard [McAleese Report, Chapter 16, Section 78]. The Department’s response to the application was to request death certificates for the women who were to be exhumed and thus a further application was submitted on 28th January 1993 ‘requesting an exhumation licence for 133 named women’ [McAleese Report, Chapter 16, Section 80]. The application included three Appendices which contained details about the 133 women. Appendix 1 contained the names of 75 women for whom death certificates were provided. Appendix 2 contained the names of 34 women for whom no death certificate and no cause of death was given. The General Registrar’s Office furnished ‘No Trace’ forms for these women. Appendix 3 contained the names of 23 women who were identified by quasi-religious names (Magdalen of…) and one woman who was identified by first name only [Mary Raftery Archive: Department of the Environment response to press query made by Mary Raftery]. The McAleese Report notes that the ‘internal view in the Department, as demonstrated on the file, was that the application had been filled in carelessly’ [McAleese Report, Chapter 16, Section 81]. The Department contacted the Sisters again via their solicitors requesting death certificates for 58 women on the application [McAleese Report, Chapter 16, Section 82]. According to the McAleese Report, a ‘revised and more detailed application’ was submitted by the Sisters on 12th May 1993. This application provided ‘an explanation of the history of burials at High Park’ and details about the Sisters’ inability to locate burial records for the period from 1942 to 1968 McAleese Report, Chapter 16, Section 83]. The McAleese Report notes that after this ‘extensive correspondence’ between the solicitors representing the Sisters, the Department and the General Registrar’s Office, the Department of the Environment granted an exhumation licence to the Sisters of Our Lady of Charity on 25th May 1993 McAleese Report, Chapter 16, Section 79. On 16th June 1993, Eugene F Collins Solicitors, acting on behalf of the Sisters of Our Lady of Charity wrote to Patrick Massey Funeral Directors seeking a tender for the work of exhuming the remains at St. Mary’s graveyard [Mary Raftery Archive: Letter of 16th June 1993 from Eugene F Collins Solicitors, Ref MEB/GH/JK]. The letter sought a quote for i) exhumation and subsequent burial or ii) exhumation and subsequent cremation. The solicitors noted that ‘[i]t is vital for our clients that prices are quoted in respect of the above as our clients wish to keep costs to a minimum’. Indeed, the issue of cost is further discussed on four other occasions in the letter. Patrick Massey Funeral Directors responded to the request with a quotation of £30,000 [Mary Raftery Archive: Letter of 13th July 1993 from Patrick Massey Funeral Directors]. In breaking down the costs the letter noted that the ‘coffins will be simple with no embellishments and suitable for cremation’. The funeral directors also noted that ‘[t]he difference in cost between earth burial for all and cremation is so great that, bearing in mind that your clients wish to keep costs to a minimum, the former is not really on the cards’. It is interesting to note that according to Canon Law 1176 (3), ‘t]he [Catholic] church earnestly recommends that the pious custom of burial be retained; but it does not forbid cremation, unless this is chosen for reasons which are contrary to Christian teaching’. The Sisters of Our Lady of Charity accepted the tender according to the terms outlined on condition that no further costs would be incurred [Mary Raftery Archive: Letter of 11th August 1993 from Eugene F Collins Solicitors, Ref MEB/GH/EM]. According to the McAleease Report, the exhumation process commenced on 23rd August 1993 [McAleese Report, Chapter 16, Section 90]. The Report notes that the undertakers became aware that additional remains were buried in the graveyard that had not been accounted for on the exhumation licence. On 30th August 1993 the Sisters (via their solicitors) made another exhumation licence application to the Department of the Environment and the following day the Department granted a licence for ‘the exhumation of all human remains’ [McAleese Report, Chapter 16, Section 91]. On 1st September 1993 Patrick Massey Funeral Directors submitted a tender of £9,350 to the solicitors representing the Sisters for the exhumation and cremation of the additional remains. The letter noted that the ‘tender is based on a maximum number of 24 [additional remains] and any further numbers will involve a further charge of £380 each’ [Mary Raftery Archive: Letter of 1st September 1993 from Patrick Massey Funeral Directors to Eugene F Collins Solicitors]. It would seem reasonable to assume that at this point it was not known how many additional remains were buried at St. Mary’s. Indeed, 10 years later in 2003, the Department of the Environment seemed to be aware of just ’14 additional persons’ [Mary Raftery Archive: Department of the Environment response to press query made by Mary Raftery]. On 1st September 1993 Patrick Massey Funeral Directors also wrote to Sr Ann Marie Ryan of the Sisters of Our Lady of Charity [Mary Raftery Archive: Letter of 1st September 1993 from Patrick Massey Funeral Directors to Sr Ann Marie Ryan]. The letter outlined a difficulty with the original tender for the cremation of the exhumed remains which had allowed for the accommodation of two to three women per coffin. The letter states that ‘this was not achieved in practice due to the attending Dublin Corporation observers insisting on more coffins being used’. It would appear from this correspondence that it was originally anticipated that 60 coffins would be used, however 100 were ultimately required. On 9th September 1993 Patrick Massey Funeral Directors wrote to Sr Ann Marie Ryan of the Sisters of Our Lady of Charity to submit the total charge in relation to the exhumations at High Park, which amounted to £41,350 [Mary Raftery Archive: Letter of 9th September 1993 from Patrick Massey Funeral Directors to Sr Ann Marie Ryan]. On 20th September 1993, Patrick Massey Funeral Directors wrote again to Sr Ann Marie Ryan submitting an invoice for the same amount [Mary Raftery Archive: Letter of 20th September 1993 from Patrick Massey Funeral Directors to Sr Ann Marie Ryan]. On 1st November 1993, the solicitors acting for the Sisters of Our Lady of Charity wrote to Patrick Massey Funeral Directors enclosing a cheque for £20,675 which was the ‘purchasers’ contribution’ to the costs [Mary Raftery Archive: Letter of 1st November 1993 from Eugene F Collins Solicitors, Ref MEB/RD]. This sum is half of £41,350, indicating that the order had got the land purchasers to cover half of the costs. The circumstances outlined above cast considerable doubt on Provincial Superior Sr Angela Fahy’s assertions in September 1993 that ‘the graveyard site was small and worth about £9,000, while the exhumation cost £45,000’ [Irish Independent, 13th September 1993, Page 4]. However, it is clear from correspondence between the Sisters’ solicitors and the undertakers that the order was ‘selling part of their lands at High Park Convent which lands include an old grave ground’ [Mary Raftery Archive: Letter of 16th June 1993 from Eugene F Collins Solicitors, Ref MEB/GH/JK]. It is also of note that the same land (which included the graveyard) sold for an estimated £1.5 million just one year later [Irish Independent, 6th May 1994, Page 30]. After media reports that 133 women were being exhumed at High Park, JFM’s predecessor organisation, the Magdalene Memorial Committee (MMC) was founded. The group sought a public funeral for the exhumed women [Irish Times, 21st September 1993, Page 10] and successfully campaigned for a memorial to be instated for the women, in the form of a plaque on a bench at St. Stephen’s Green in Dublin, which was unveiled by then President Mary Robinson in 1996 [Irish Times, 22nd April, 1996, Page 4]. On 11th September 1993 the cremated remains of 154 of the 155 women were reburied at Glasnevin Cemetery [Irish Times, 13th September 1993, Page 4] as one family took the remains of their relative to be buried in a family plot [Mary Raftery Archive: Statement from Sisters of Our Lady of Charity]. Anger was expressed at the time at the refusal of a public funeral and that the ceremony committing the ashes to a plot in Glasnevin had taken place without notifying the families of the women or the general public [Irish Times, 13th September 1993, Page 4]. Margo Kelly of the MMC said that ‘the Catholic Church had an opportunity to make amends…[b]ut the same veil of silence that put those women away in the first place was still there’. Because they were contacted by a journalist, the members of the MMC managed to arrive at Glasnevin just in time to look into the grave to view the urns and see the grave being filled in [Irish Times, 21st September 1993, Page 10]. The McAleese Report states that a number of examinations of the circumstances surrounding the exhumations at High Park have taken place. The Report notes that at the time of the exhumations, the Dublin Cemeteries Committee asked the Dublin City Coroner to ‘ensure that the conditions of the exhumation licence were adhered to‘ [McAleese Report, Chapter 16, Section 94]. The Coroner confirmed that all remains were adult and female, that they were buried correctly and that the condition of the remains was ‘”in keeping with what one would expect to find” in the circumstances’ [McAleese Report, Chapter 16, Section 116].The Report also says that the Gardaí ‘carried out enquiries’ in relation to the exhumations in both 2003 and 2012 and that ‘[t]hese enquiries concluded without any suggestion of criminal action or wrongdoing’ and that on the basis of research carried out (see below) ‘no further action on the matter was deemed necessary’ [McAleese Report, Chapter 16, Section 118]. …legislation does not require that death certificates are furnished in the course of an exhumation application – indeed, it is possible for applications to be made for unknown remains or for exhumations in an area where there is reason to believe that unknown remains may be found [McAleese Report, Chapter 16, Section 99]. The Report further notes that a 1990 Circular from the Department of the Environment stated that exhumation applications should be accompanied by death certificates, but that ‘it should not be insisted upon where a death certificate would be inordinately difficult to obtain’ [McAleese Report, Chapter 16, Section 100]. In 2003 Mary Raftery asked the Department to explain what was meant by ‘inordinately difficult to obtain’. The Department responded that ‘[r]easons, other than passage of a fixed number of years since the death of the person(s) to be exhumed, could give rise to difficulty in obtaining a death certificate’ [Mary Raftery Archive: Press Query of 28th March 2003 to Department of Environment]. The McAleese Report concludes that the absence of death certificates did not prevent the Department from issuing the exhumation licence [McAleese Report, Chapter 16, Section 103]. While this may be the case, the McAleese Report still ignored a fundamental question and offers no critique of the fact that the Sisters failed to register all deaths, irrespective of whether or not they were a requirement for the exhumation. A researcher on this topic had, in 2010, indicated to the Gardaí a view that the absence of death certificates for certain of the women involved was “down to the lack of a single historical database of all residence” [sic] and the need for full and accurate information to secure death certificates from the GRO [McAleese Report, Chapter 16, Section 109]. The McAleese Committee accepted this ‘administrative reason’ [McAleese Report, Chapter 16, Section 110] as an explanation for the anomalies surrounding the exhumations. While the Report extensively quotes the legislation surrounding exhumations and death registration, it does not include the research conducted by the Sisters of Our Lady of Charity and the same research is not available in the public domain. And, despite the existence of this research, as outlined below, serious errors remain at the Sisters of Our Lady of Charity burial sites. JFMR has been conducting searches of the records at Glasnevin Cemetery through its online genealogy service. This research is ongoing and the following outlines what we have discovered thus far. JFMR would like to clarify that the following analysis implies no wrongdoing on the part of Glasnevin Cemetery. Indeed, without the online service and excellent record keeping at Glasnevin, we would not have been able to identify any of these women. On 19th February, 2014 an RTÉ report covering the first anniversary of the Magdalene State apology featured footage of an unmarked grave associated with High Park. As JFMR was not familiar with this grave, we contacted the reporter to enquire about the location. He told us that the grave had been shown to RTÉ by Glasnevin Historian Shane MacThomais and suggested that we contact him. JFMR contacted Mr MacThomais who said he had recently located the grave and that he believed there was another grave with over 30 women interred there. It was agreed to organise a meeting to view the graves, but sadly, Mr MacThomais died a month later, before the arrangement had been made. In an effort to ascertain the whereabouts of the grave, JFMR took screenshots from the RTÉ footage and using these we were able find the approximate location on our next visit to Glasnevin. We do not know how many women are buried in that location and have no names with which to search the online records for Glasnevin. We also do not know whether the second location to which Mr MacThomais referred is one of the newly discovered graves described below or if there is another grave which we have not yet located. JFMR conducted a search of Glasnevin Cemetery’s records for the 187 names engraved on headstones at the site where the women exhumed from High Park in 1993 are purportedly buried. These women died between 1895 and 2006. We were unable to locate records for 131 of these names and it would appear that the remaining 56 women are interred in 4 separate locations at Glasnevin. Out of the 131 women who cannot be located in Glasnevin’s records, 54 died between 1922 and 1991 when High Park closed, i.e. the time period covered by the IDC Report. In fact, just 33 out of 187 women whose names inscribed on the headstone are buried at that location. Of the 56 women whose names we did find, 14 had discrepancies between the headstone and the record at Glasnevin (excluding discrepancies involving first names). ‘Extended’ searches were carried out for these 56 names, revealing other women buried in the same graves, 13 of whom are buried in the ‘main’ High Park grave location but whose names are not inscribed on the headstone. These searches, along with a number of ‘wildcard’ attempts have thus far uncovered the names of 106 women who are buried at 7 separate locations at Glasnevin. These women died between 1886 and 1999, while 30 from this cohort died between 1922 and the closure of High Park in 1991. JFMR also searched Glasnevin’s records for the available names from Appendices 1-3 and the list of ‘other women’ supplied by the Sisters of Our Lady of Charity to the Department of the Environment as part of the order’s application for an exhumation licence in 1993. A total of 87 of these names do not appear on the headstone. It was only possible to search for 63 of the 87 names as 23 women are listed under quasi-religious names (Magdalen of…) and one woman is listed by first name only. Of the 63 available names, JFMR could find only 5 of these women in Glasnevin’s records and they are buried in 3 separate locations. These women are purportedly buried at the ‘main’ High Park grave at Glasnevin; however in actual fact just 3 of them can be found at that location. Therefore, the burial place of a total of 213 women from High Park is unknown. Photographs of the grave locations with (redacted) lists of names, and a corresponding map are available here.